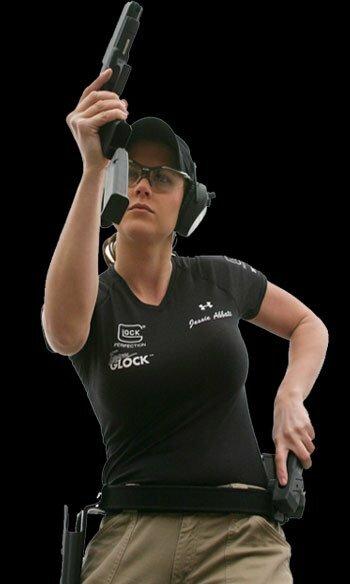 Team Glock’s Jessie Abbate is the new Ladies USPSA Multi-Gun National Champion. Bringing a new level of grace, speed, and accuracy to the Multi-Gun discipline, Jessie took top honors among women in the recent USPSA Multi-Gun National Championship in Tulsa, Oklahoma. The three-gun match consisted of 12 stages. 3 stages were shot with a pistol, 3 with a rifle, 3 utilized a shotgun, and 3 were multi-gun. Each stage presented different levels of difficulty such as swinging shotgun and rifle targets, multiple moving pistol targets and long range rifle shots past 300 yards. Other stages were designed for speed which allowed shooters to employ all three of their guns. Jessie used an MSTN AR-15 type carbine in the rifle stages, a 12 gauge for the shotgun segments, and a Glock 34 for the pistol stages. Jessie reports: “I started the match off Friday morning with a great shotgun stage followed by exceptional rifle and pistol stages. But as I was shooting with multiple guns, I began to tire and made small mistakes that cost me some points. With the long-range rifle stage at the end of the day, I just wanted to survive it so I could move on and put it behind me.” Jessie began the second day with a fresh outlook and shot smoothly and consistently. Abbate wrapped up the last day of competition with a 200-point victory and the Ladies Multi-Gun National Championship. The lovely Jessie is now one of America’s top action shooters. Jessie began shooting by going to the range with her father. With the training she received from her father, a world champion cowboy action shooter, and help from her husband Billy, a USPSA Grandmaster, Jessie’s pistol shooting skills continue to grow. She now competes in practical and steel shooting sports with Glock pistols. Jessie was welcomed to Team Glock in the summer of 2006. Jessie balances a busy schedule with her job in the family business in Georgia, going to school for a business degree and training on the shooting range. Photos courtesy Glock Inc., and Team Glock. Share the post "Jessie Abbate Wins Multi-Gun USPSA Championship"
In cooperation with Tom Meyers, Whidden Gunworks is now the North American source for the Davies triggers, providing both trigger sales and installation. Crafted in Australia, Davies triggers are popular with long-range Highpower and Palma shooters, and these triggers are also well-suited for F-Class. 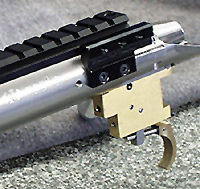 The Davies trigger adjusts for pull weight, and the mounting of the trigger shoe allows the shooter to adjust both length of pull and trigger shoe angle. The Davies regular weight trigger adjusts from 1 lb, 2 oz. to 3.5 pounds pull weight. Davies’ F-Class triggers will adjust from 4 oz. to 1 pound. Both Regular and F-Class triggers should fit all actions that will accept Remington-pattern triggers. If a Jewell trigger can work with your gun, so should a Davies. Price of the triggers is $275 plus shipping. If you don’t wish to install the trigger yourself, Whidden Gunworks can install both regular pull weight and F-Class triggers. For more info, visit WhiddenGunworks.net or call (229) 686-1911. John Whidden will add Davies trigger photos/specs to his website soon. Davies trigger photo courtesy Warner Tool Company. Share the post "Whidden Gunworks Offers Davies Triggers"
Here’s a nice do-it-yourself project for the winter. Simpson, maker of Strong-Tie fasteners, offers FREE Workbench Plans for a sturdy, 48″-wide bench with a pegboard backing and both upper and lower shelves. A complete list of fasteners and cut lengths is provided. For use as a loading bench with mounted presses, you can double-up the bench-top for extra ridigity. Without much difficulty, the plans can be adapted to build a wider bench if you prefer. The same downloadable document also contains plans for an 80″-high 6-shelf unit, a 72″-high heavy-duty shelving unit (with 4 shelves), and a 48″-wide heavy-duty table. Share the post "FREE Heavy-Duty Workbench Plans"